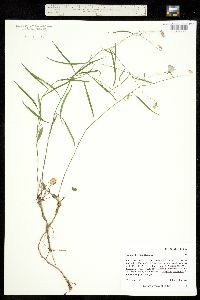 Perennial herb 10 - 80 cm tall Stem: erect, unbranched to freely branched, slender, and smooth, though possibly with inconspicuous, short, stiff hairs. If the stem is broken or cut, it exudes milky sap. Flowers: one to fifteen (rarely solitary), stalked, purplish blue, 1.5 - 3 cm long, bell-shaped, radially symmetric, and in an elongate, loose inflorescence, or sometimes on very short branches. Sepals: five, but fused at base, then separating into 0.4 - 1.2 cm long, narrow lobes. 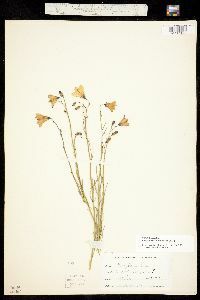 Petals: five, but fused for most of their length, then separating into very short, triangular lobes. Stamens: five, with filaments attached to the base of the petal tube. Pistil: with a single, three-chambered, inferior ovary; a single style, which is shorter than the petals; and a three-lobed stigma. Fruit: a nodding, many-seeded, three-chambered, 2 - 6 mm long, egg-shaped or almost cylindric capsule, which opens by three pores near the base. Basal leaves: long-stalked, rounded or broadly egg-shaped (blade to 2 cm long), sharply toothed, and usually dying back by flowering time. Stem leaves: fairly numerous, alternate, stalkless, 1.5 - 8 cm long, very narrow (seldom reaching 1 cm wide), and hairless on both surfaces. Similar species: Campanula rotundifolia is somewhat similar to the smaller and small-flowered species C. aparinoides (as well as C. aparinoides ssp. 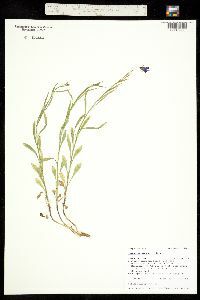 uliginosa). However C. aparinoides can be distinguished by its generally weaker, reclining stems, which are rough-hairy on the angles. 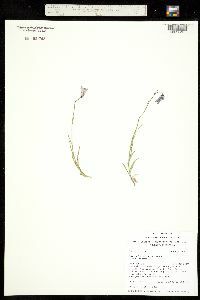 The remaining species of Campanula in our area are more robust, and have larger flowers. 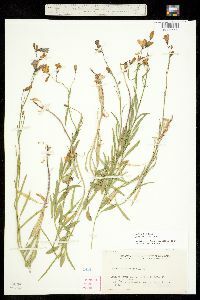 Habitat and ecology: Not common in our area, but found in several diverse habitats such as sandy black oak savannas, hill prairies, and rock cliffs. 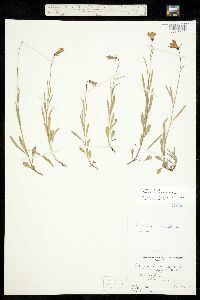 This boreal species is more commonly found to the north of the Chicago Region. Notes: Campanula rotundifolia is a boreal plant, which is found in northern regions around the globe (circumboreal). 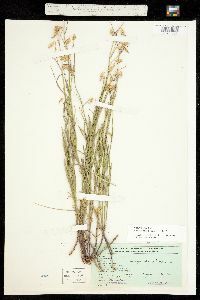 The physical characters of this species, such as size, stature, texture, number of flowers, and number of branches per stem, vary widely in response to changes in environment such as moisture, nutriment, and sun exposure. In sandy or gravelly soil usually on the slopes and ledges of banks of streams and lakes. 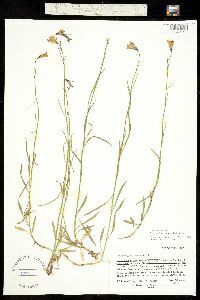 This is the true species and has the stems densely pubescent at the base and is found in Europe and western America and rarely inland or in eastern America. 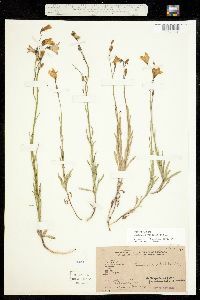 I found it on the gravelly bank of the south side of Lake Gage in Steuben County, and on the slope of the high, wooded bank of the south side of North Twin Lake in Lagrange County where it was growing side by side with the glabrous form which was common, while the species was rare. [Variety intercedens] is the glabrous form of the species; it is found in the interior and eastern North America. The habitat is the same as that of the [full] species. I found it common, however, on the north side of the Wabash River below Georgetown in Cass County, in the upper crevices of the 10 foot rock cliff which forms the bank of the river. This variety is more or less frequent throughout most of the lake area where its habitat is well represented. The var. 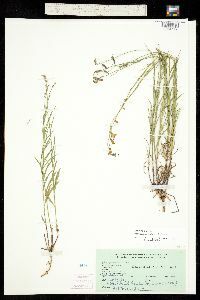 arctica Lange has been reported by Peattie as occurring in the dunes. This is merely a dwarf form of the preceding variety and I regard it as an ecological variation without taxonomic significance. Perennial, 1-8 dm, glabrous or inconspicuously hispidulous; basal lvs petiolate, often with broadly ovate to subrotund or cordate-rotund, angular-toothed blade to 2 cm, sometimes merely oblanceolate, often deciduous; cauline lvs ±numerous, commonly linear or nearly so, 1.5-8 cm, seldom 1 cm wide; fls typically several or rather many in a lax, racemiform or elongate- paniculiform infl, solitary in depauperate or subalpine specimens; cal-lobes 4-12 mm; cor blue, 1.5-3 cm, campanulate, the lobes much shorter than the tube; style not exceeding the cor; fr nodding, opening near the base; 2n=34, 56, 68, 102, etc. Dry woods, meadows, cliffs, and beaches; circumboreal, s. in Amer. to N.J., Ind., Io. and Mex. June-Sept.